Hearing loss is something that everyone experiences throughout their lifetime. Natural aging can mean that hearing loss occurs slowly and subtly. Whereas, exposure to loud noises can result in rapid and immediate hearing loss. 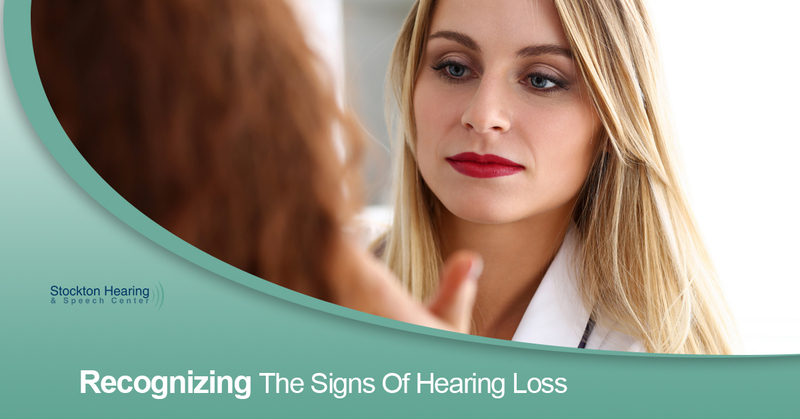 Because of the range of hearing loss in individuals, it can be difficult to recognize the symptoms in some cases. The Stockton Hearing & Health Center in Stockton has over 40 years of experience in working with individuals who have experienced hearing loss or are in need of hearing aids. Below, you’ll find our brief guide to recognizing the signs of hearing loss. Hearing loss is, of course, when the ability to hear is reduced. Hearing loss can impact your ability to hear speech or other sounds, and can significantly impact your quality of life. Hearing loss occurs naturally as we age. Typically, beginning in our 30s and 40s, our hearing begins to worsen, and we might experience the symptoms of hearing loss. This is, in most cases, a gradual process, and many do not even realize that it has occurred. Later in life, more than half of all people will suffer significant hearing loss of some kind. This age-related loss of hearing is known as presbycusis. But in other cases, hearing loss can be the result of some diseases or infections, damage to the ear, injuries to the head, or exposure to loud noise for a long period of time. People’s voices sound muffled: Does it sound like people are always mumbling during your conversations? Or maybe it sounds like they have a pillow in front of their face when they speak. The TV and Radio never seem loud enough: Do you find yourself constantly reaching for the remote to turn up the volume of the TV? Does the radio seem to be quieter than usual? Have you suddenly started using the subtitles for your favorite movies and shows just to keep up with what’s being said? Noisy environments make communication difficult: If you’ve found yourself at a party or gathering, and have struggled to keep track of the conversation because of the surrounding noise, this is a clear sign of hearing loss. You find yourself struggling to keep up with a conversation: Those who suffer from hearing loss may begin to start reading the lips of whoever they are talking too in an effort to understand what they’re saying. Some might feel like they’re having to concentrate harder to hear whoever is talking to them, especially if they are whispering or speaking in a low voice. All of these experiences are signs that you might have hearing loss. While the obvious negative aspect of hearing loss is a dulling of one of your senses, even beyond that, living with hearing loss can be frustrating. Oftentimes, those with hearing loss have a difficult time maintaining their social lives, as they cannot follow conversations with groups of friends and family. They have to ask someone to repeat themselves several times and may respond inappropriately as a result. The ringing in their ear might prove to be a constant distraction in their daily life. Of course, all of this can lead to a sense of being emotionally drained. Those with hearing loss may feel stressed by their constant straining to hear others. They might feel guilty that others are constantly having to repeat themselves in order to be heard. Some begin to retreat from social situations rather than having to deal with the struggle of hearing others. If you are experiencing any of the symptoms listed above, don’t fret. You don’t have to continue to live your life in a frustrating and draining manner. If you suspect you or a loved one is suffering from hearing loss, encourage them to meet with a hearing care professional right away. These professionals can provide you with a diagnostic hearing evaluation that can test your overall hearing capabilities. This diagnosis will measure the extent and type of your hearing loss, which will help you develop a hearing loss management plan. In some cases, this plan might include the use of a hearing aid. At Stockton Hearing & Health Center, we’ve been fitting patients with hearing aids for decades. We’ll take the time to evaluate your hearing aid needs, and make sure you are fitted with a hearing aid that best meets your needs. If you have questions about hearing loss or being fitted for a hearing aid, don’t hesitate to reach out to us today.